There are various safety risks to offshore workers with fire being one of the deadliest. The setting itself is a risk as drilling platforms are located far from help, the product is virtually an inexhaustible source of combustible gas or liquid fuel, large amounts of the fuel are stored on the rig until it can be brought to shore, and the process to obtain the product involves large-scale machinery that can contribute to producing a spark to ignite the fuel. In addition, hand-held tools are often used for repairs and maintenance of facilities where a spark could also start a fire. This makes offshore drilling platforms one of he most dangerous places to work. As with all areas of high risk for fire, the company and workers must be trained and vigilant in adhering to safety regulations to ensure an atmosphere of fire prevention. 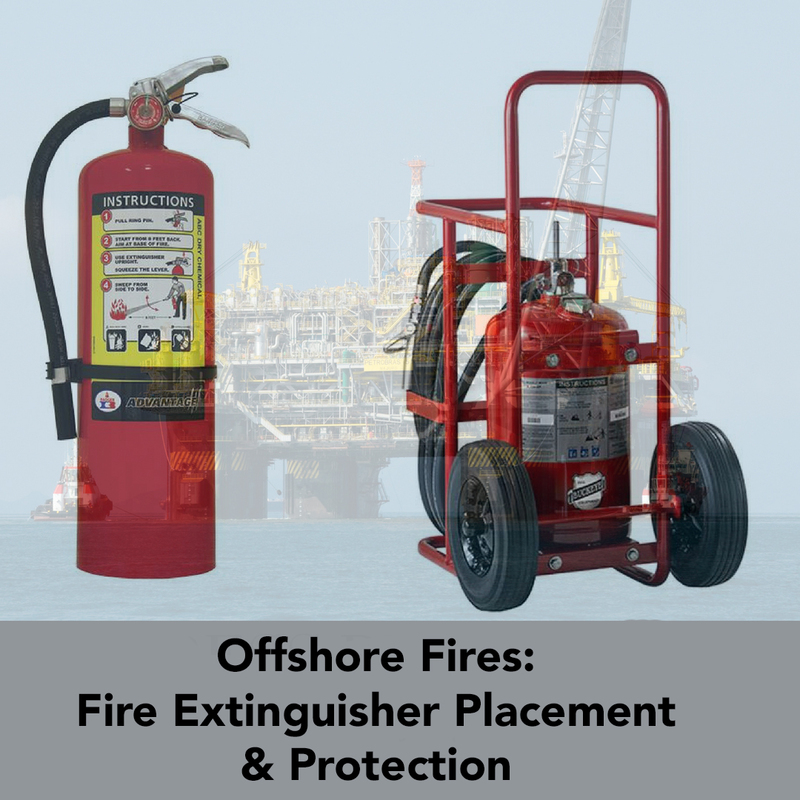 The offshore setting poses some unique challenges ranging from the extreme environmental conditions, the potential need for large wheeled fire extinguishers as well as smaller hand-held units, to split second decision making as to fight the fire or seek to escape. All of these require unique fire safety regulations and prevention strategies to minimize risk. In addition to fire prevention strategies, having the right equipment readily available and accessible should a fire occur is the next line of defense to reduce loss of life and property damage. For fire extinguishers to be readily available they must be highly visible, strategically located, and sufficient in number and extinguishing capacity to ensure quick access and efficient use. This article will discuss some key regulations and strategies for their strategic placement. Extinguishers should be mounted where they can be easily seen and highly visible in color for attraction. Areas of high traffic may be optimal for high visibility. Mount or storage locations should never be obstructed to ensure easy and quick accessibility. Hand-held fire extinguishers should be installed on hangers or brackets or in identified containers. Placement on a shelf is also acceptable if it meets the easily seen and readably accessible guidelines. Hand-held portable fire extinguishers must be installed to provide adequate clearance between the bottom of the extinguisher and the floor. A minimum of 4” from the deck is required to help protect against salt water corrosion. When not in use, fire extinguishers are to be stored in their designated storage areas. Extinguishers should be located away from potential explosion or fire areas and sufficient in number so as overall fire control capability is not seriously impaired by a single fire. A maximum of 50 feet (15.2 m) is the farthest distance from the fire extinguisher location to any point on the platform deck having a potential for fire. “Open” Internal combustion or gas turbine engines: One extinguisher is to be installed for three engines. Steel cylinders and wheeled model frames are treated with a galvanizing compound undercoat, baked-on enamel top coat, and protective clear coat finish to prevent corrosion and fading from exposure to sun and sea.